Two men left home to plant a church in a city of need. One arrived prior to the other. He dreamed of a city reached for Jesus with the gospel. Through this prior pastor, people came to know Jesus, believers gathered, a community of Jesus followers was born. It was a slow work but it was happening. His prayers were being answered. In time, he began to meet with the one who arrived later, in order to encourage the newcomer. The old-timer and the new-comer prayed for Jesus to reach the city for the gospel. Through the newcomer pastor, people came to know Jesus, believers gathered, a community of Jesus followers was born. Ten years later, the one who came first pastors an ordinary church. Its two hundred-plus members demonstrate the love of Jesus in ways that did not exist there ten years earlier. The newcomer who came second pastors a famous church. Its thousands of members and multiple sites around the city demonstrate the love of Jesus in ways that did not exist there ten years earlier. The prayers of both men were answered. Why then is one of them sad? This means that, one way or another, man must be broken and die: either in salvation or in judgment. To fall on that Stone, to die in union with Jesus, for His sake and the gospel's, is salvation; it is to drink of His cup and be baptizes with His baptism. But he who refuses to lose his selfhood will have it taken away from him. If he will not have the Coming of the Son of Man for salvation, he will have it for judgment. Indeed, this way of salvation through the losing of life is the royal road which the Messiah Himself takes. A strong place and wonderful was Isengard, and long it had been beautiful; and there great lords had dwelt, the wardens of Gondor upon the West, and wise men that watched the stars. But slowly Saruman had shaped it to his shifting purposes, and made it better, as he thought, being deceived--for all those arts and subtle devices, for which he forsook his former wisdom, and which fondly he imagined were his own, came but from Mordor; so that what he made was naught, only a little copy, a child's model or a slave's flattery, of that vast fortress, armoury, prison, furnace of great power, Barad-dur, the Dark Tower, which suffered no rival, and laughed at flattery, biding its time, secure in its pride and its immeasurable strength. Preached recently at a church that hosted me with remarkable thoughtfulness and it caused me to reflect on how inviting churches can host as well as my most recent experience, and also what should be the specific aims of a guest preacher. To be filtered through your own wisdom and good sense. 1. Give him guidance about what to preach on. Or not to preach on--it's awkward to be told 'Preach on whatever you want' only to show up and discover you're preaching the same text as the previous week. 2. If he wasn't your first choice to pinch hit that day, don't tell him. 3. Tell him what time to show up, and how long he should preach for. 4. Tell him who is going to greet him, and where. Be sure he has directions to the church. Tell him about any road-work to avoid. 5. Let him know what kind of mic he'll be using, and if he has a choice, ask his preference. Explain how the mic works when it is given to him. Tell him if powerpoint is an option. Tell him if there will be a podium, pulpit, or nothing. Give him guidance about dress code. In short, don't assume anything; err on the side of giving him too much information rather than too little. 6. Don't ask him to administer a sacrament. Do the sacrament another day, or ask an elder or pastor of the church to do it. He is in a strange place and doesn't know the particulars of your church's practices, which for you seem totally normal and obvious. Let him focus on the preaching event. 7. Send him a PDF of the bulletin or some kind of write-up that outlines clearly the flow of the service. Tell him exactly at what point he will be getting up to preach, where he will be sitting for the service (front row? chair on stage? anywhere he wants? ), and what the cue will be for him to get up to preach. Let him know how he should end (pray? invite someone else up? a brief interpretive dance? ), and what will happen right afterward. If you expect him to give a benediction tell him. 8. Pray with him before the service. 9. If the passage on which he is preaching is going to be read by someone else in the service, tell him beforehand. Sometimes the preacher builds the Scripture reading into the opening of his message in such a way that creates awkwardness of transition if he has to excise the Scripture reading from his sermon at the last minute. 10. Identify for him what version of the Bible your church normally uses in public worship, and how important or unimportant it is that the guest preacher stick to that. 11. After he preaches, even if it was the worst sermon you've heard in a long time, find some way to affirm him. And do so by identifying something specific in his sermon that helped you. 'Good job!' is pretty much a zero response. 'I was helped when you said...' is what he needs to hear. If he invites it, offer critique. And through it all remember that it's much easier to criticize preaching than to preach. 12. Tell him beforehand how much you're going to pay him. That is not unspiritual. It is blessed clarity. He deserves it. 13. Pay him well, a la 1 Cor. 9:11. Honor him and his family, if he has one, in that way. Obviously there are no hard and fast rules to lay down as churches and social contexts differ so widely. But I think it would be a good rule of thumb, in a church of 100 members or more, finances permitting, to pay the man 1% of the approximate average annual salary of your members. I.e. if the average household income is $50,000, that would be a check to the guest preacher of $500. Another way to look at that is that you're paying him for about half a week's work (52 weeks per year is 104 half-weeks per year--and $50,000 divided by 104 is about $500, too). If there is more than one service, adjust that number as you see fit. If he has driven a distance to join you, cover that expense. 14. Follow up the week after. Thank him. Even if you intend never to invite him back, thank him and encourage him, as you are able to do so with honesty. 1. You are not there to impress them. You are there to help them. 2. You are not there to outshine their regular preaching pastor. You are there to help them. 3. You are not there to make a little extra cash. You are there to help them. 4. Time permitting, do something fresh. Don't pull one out of the Sermons Folder unless you have to (or if they explicitly encourage it in the invitation, knowing you are currently pressed for time). It is harder to prepare a fresh message. But much more fun, more powerful, more meaningful, less robotic for you, and generally, I think, more edifying to the listeners. 5. Every church has its own theology, its own ethos, and its own view of preaching. Nevertheless, preach the gospel. Don't give a pep talk. Don't give advice, like I am here. Just tell them why Jesus is better than they think. Prepare your message with Luke 24:27 and John 5:39 and Acts 20:24 written out on sticky tabs stuck to your laptop. Whatever you do, give them gospel oxygen. Let them breathe again. 6. You are not there to change their church in any kind of structural or theological way. Even if they need it. Nor to make subtle suggestions. That's not the role of a guest preacher. You are there to encourage and edify them on whatever points you and they agree on. If you can't find enough central things to agree on, decline the invitation. 7. Don't say yes out of obligation (it's hard to preach grace when you do it out of a law-mindset) or because you think you might never get another chance to preach (if God wants you to preach he'll open up the doors) or because if you don't preach then they're missing out (they're not). Say yes if you have time to prepare well, and out of a glad sense of privilege, more confident in the power of the Word than the power of your persona. 8. Whether you agree to preach for them or not, thank them for the kind invitation. You don't deserve it. 9. Don't be scolding. There is a time for a certain kind of scolding, perhaps, when immaturity must be lovingly confronted (1 Cor 4 comes to mind). But not from a guest preacher. 10. As Calvin Miller recently wrote, it is just as important to know your context as it is to know your text. Seek to know the history, especially recent history, of that church. 11. As you leave, remember two things: (1) you are not as great a preacher as you think you are, and (2) your preaching is more effective than you think it is. Jesus is Himself the End. There is nothing revealed to us in the purposes of God which does not have its fulfillment in Jesus Christ (2 Cor. 1:20). All that the Old Testament believers looked forward to in the day of the Lord finds its realization in Jesus: the passover (1 Cor. 5:7), the exodus (Luke 9:31), the covenant (Matt. 26:28), the law (John 13:34; Rom. 10:4), the tabernacle (John 1:14), the bread from heaven (John 6:35), Canaan (1 Pet. 1:4; Heb. 11:16), David (John 1:49), Jerusalem (Heb. 12:22; Rev. 21:10-14), the Temple (John 2:21; Acts 15:16). But Jesus not only concludes and fulfills the historical experience of old Israel; He fulfills also the more ancient history of creation. He is the last Adam (1 Cor. 15:45), the firstborn of all creation (Col. 1:15), who has already received the glory and dominion with which it was God's purpose to endow man (Heb. 2:5-9). The End has therefore come in Jesus Christ. . . . There is nothing whatever of all God's purposes of salvation which has not been fulfilled in Him. O how infinitely great will the privilege and happiness of such be, who at that time shall go to be with Christ in his glory. . . .
[It is] the privilege of being with Christ in heaven, where he sits on the right hand of God, in the glory of the King and God of angels, and of the whole universe, shining forth as the great light, the bright sun of that world of glory, there to dwell in the full, constant, and everlasting view of his beauty and brightness, there most freely and intimately to converse with him, and fully to enjoy his love, as his friends and spouse, there to have fellowship with him in the infinite pleasure and joy he has in the enjoyment of his Father, there to sit with him on his throne, and reign with him in the possession of all things, and partake with him in the joy and glory of his victory over his enemies, and the advancement of his in the world, and to join with him in joyful songs of praise, to his Father and their Father, to his God and their God, forever and ever. Is not such a privilege the worth seeking after? It is a matter of common experience that the really important lessons which we all have to learn in our lives are not learned once for all and then retained, but learned, then forgotten, then re-learned; most of us have had the humiliating experience of learning some spiritual lesson, and then finding that it was substantially an old lesson, which we thought that we had firmly grasped five or ten years before. A thought occurs to me: do I possess a stamina for going unnoticed? Can I handle being overlooked? Do I have a spirituality that equips me to do an unknown thing for his glory? In general for some time past biblical scholarship has to a large extent failed in its duty to the Church, whose life the Bible nourishes, because its underlying presuppositions have been those of humanistic science. Our so-called theological studies have in many cases been studies in textual and documentary criticism, in archaeology, in comparative religion, or in the development of religious ideas, instead of being in the proper sense theological studies--that is, studies of human life . . . in relation to the truth of God, and of God's own redemptive action towards mankind. Theology, it has well been said, is a kind of reverse science, dealing with all the things that other sciences deal with, but seeing them in relation to their First Cause and Final Cause. I am reflecting on my grandfather these days, my dad's dad. Partly because I have a Bible of his from the 1980s lying on my desk at Crossway. I flop it open frequently to see what he was jotting down in the margins about various passages that become meaningful to me on any given day. 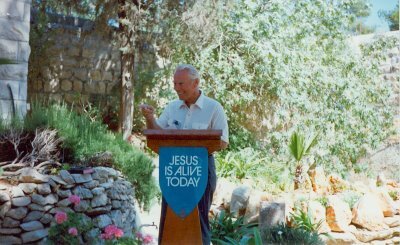 In the picture here he's preaching near the empty garden tomb in Jerusalem, 1992. Sunday evening my dad died. He was the most godly man I've ever known. I was fearful that he might linger and suffer a long time. But God in mercy took dad more quickly than I expected. So now, dad is released from this life. He is safe in heaven forever, beyond the reach of sin and Satan. And dad is happy, because he is finally with the Lord he loved since his conversion at the age of 12. He is worshiping Christ with inconceivable joys because of the finished work of the cross for sinners. My lasting thought on my dad is not only that he was a wonderful father to me personally and a wonderful pastor to so many but also that he embodied classical Christian piety with authentic beauty. He loved his Lord tenderly and reverently. He believed the Bible entirely. He honored the Lordship of Christ over the whole of life. He led people to new faith in Christ. He was a faithful husband and father. He preached with an astonishing ability to help people connect with the Lord. He was generous with his money. He thought carefully about theology. And he enjoyed the daily things of this life, because God is good. And dad was kind, so very kind, to everyone around. It is inconceivable to me that dad would compromise the high standards of Christian holiness, so consistent was his life. These basics are demanding, but they make a man great. They make the church great. And we must not become so sophisticated that we lose them in our time. Now it is our turn to take up this baton and run well, passing it on to those who follow. Mom and the rest of us will miss him terribly. Jani and I still cannot absorb the fact that he is not here. It is stunning, isn't it, to think that none of us can even call him on the phone? (Oh, let us stay close and love one another avidly, while we can!) But soon we will see dad again, for we ourselves have been claimed by Christ, and he has our hearts. If we will walk with the Lord in the simple basics, then we too will be ready to leave this life behind and be lifted into that which is truly life forever. Dad, well done! I love you, and I'll see you soon. But not soon enough. A nice introduction to one of our time's great expositors. "Remember, remember, remember the Signs. Say them to yourself when you wake in the morning and when you lie down at night, and when you wake in the middle of the night. And whatever strange things may happen to you, let nothing turn your mind from following the Signs. "And secondly, I give you a warning. Here on the mountain I have spoken to you clearly. I will not often do so down in Narnia. Here on the mountain, the air is clear and your mind is clear; as you drop down into Narnia, the air will thicken. Take great care that it does not confuse your mind. And the Signs which you have learned here will not look at all as you expect them to look, when you meet them there. That is why it is so important to know them by heart and pay no attention to appearances. "Remember the Signs and believe the Signs. Nothing else matters." “Why I’m what some people call, ‘a Calvinist.’” That was the title. It totaled about sixty or so pages. It was bound with red or blue plastic for a spine and then fronted with a clear cover so that the title was front and center for the reader. I was the author. I was twenty-two and zealous. I was devouring a little book by A.W. Pink entitled The Sovereignty of God. I wanted those whose adult table I wanted to join to know the truth as I saw it at the time. So I sent this treatise to my family and friends. What better way to show Jesus’s love to loved ones than by writing and sending a document they did not expect, to answer questions they were not asking, with a tone that was not warranted, in order to defend an argument that they were not engaged in or had heard of, and all of this by surprise without so much as a conversation? G. K. Chesterton (whom I would not have read at the time because he was not my “sort” of Jesus follower) once said that there was a kind of thought that stops thought. I’ve come to believe that what Chesterton said about this brand of skepticism in his generation at least partially describes what Jesus meant when he spoke to those who handled the Bible in his. By this time I knew that Jesus does not coddle church leaders who misuse his teachings to promote error. What I would later learn is that Jesus likewise does not coddle church leaders who use knowledge, even of good proper things, as a tool for arrogance and spite. What Made John Stott Come Alive? Public worship. Friendship. Birds and butterflies. Looking forward to a long, unhurried, one-on-one conversation in the new earth. He should be in no doubt that any ability he has and however much he has derives more from his devotion to prayer than his dedication to oratory; and so, by praying for himself and for those he is about to address, he must become a man of prayer before becoming a man of words. As the hour his address approaches, before he opens his thrusting lips he should lift his thirsting soul to God so that he may utter what he has drunk in and pour out what has filled him. For me, the central passage in Tolkien’s long epic comes as Frodo and Sam are about to pass into Mordor, the dark and desolate land where Sauron and Mount Doom dwell. As they pause there on the threshold, Sam shares with Frodo a profound meditation on the nature of the Road and on the nature of stories. It is a speech to which we who live in an age that has lost both its sense of purpose and its sense of history—that knows neither where it came from nor where it is going—must carefully attend. As I hinted in the previous chapter, there is good reason to believe that Tolkien’s vision of the Road and of the call matured during the seventeen years that separate The Hobbit from The Lord of the Rings: a period that includes those dark and desperate years during which England faced annihilation by the Nazis. Though Bilbo’s journey had allowed Tolkien to recover for his age much of the old magic and many of the old virtues, it lacked the proper scope to encompass the full dimensions of choice and destiny that define Frodo’s journey. 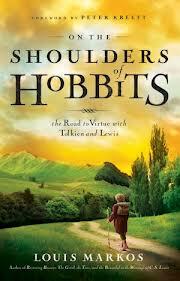 To accomplish that would take a greater tale, one that could live up to Sam’s high description. In the greater tales, the ones that matter—the ones that change both us and our world—the heroes do not so much choose the Road, as the Road chooses them. For our part, we must be ready, prepared in season and out, to answer the call, whenever and however it comes. And we must be prepared to press on, trusting to an end that we often do not, perhaps cannot, see. It is easy to claim that we would have done what Abraham did, but that is only because we stand outside the story. We see the good end, the fulfillment that Abraham could not see from within the story. I believe it was Pascal who said that only God can see the whole picture and every detail within the picture at the same time. In his moment of clarification, Sam sees that his individual call (and that of Frodo) is part of a larger tapestry in which each individual call works together to bring about the destined and hoped for end, what Tolkien liked to call the eucatastrophe: the good end that rises up, miraculously, out of what seemed, at first, to be defeat and death. If we would be a part of that eucatastrophe, then we must be willing to trust the call, to enter the tale, to set our weary feet to the Road. My own plans are made. While I can, I sail east in the Dawn Treader. When she fails me, I paddle east in my coracle. When she sinks, I shall swim east with my four paws. And when I can swim no longer, if I have not reached Aslan’s country, or shot over the edge of the world in some vast cataract, I shall sink with my nose to the sunrise and Peepiceek will be head of the talking mice in Narnia. Let us say that I have been living in the light of what God has been giving us for the present life. As a born-again child of God, I have been practicing the reality of true spirituality, as Christ has purchased it for us. For some reason my moment-by-moment belief in God falters--a fondness for some specific sin has caused me at that point not to draw in faith upon the fact of a restored relationship with the Trinity. The reality of the practice of true spirituality suddenly slips from me. I look up some morning, some afternoon, some night--and something is gone, something I have known: my quietness and my peace are gone. It is not that I am lost again, because justification is once for all. But . . . there is no exhibition of the victory of Christ upon the cross. Looking at me at this point, men would see no demonstration that God's creation of moral rational creatures is not a complete failure, or even that God exists. . . .
At this point a question must arise: Is there a way back? Or is it like a fine Bavarian porcelain cup, dropped to a tile floor so that it is smashed beyond repair? Thank God, the gospel includes this. The Bible is always realistic; it is not romantic, but deals with realism--with what I am. There is a way back, and the basis of the way back is nothing new to us. The basis is again the blood of Christ, the finished work of the Lamb of God: the once-for-all completed work of Christ upon the cross, in space, time, and history. It's election day--a good time for a great statement by George on the election that takes place before the foundation of the world, not the one that takes place as I type. We should not have so much disputing against the doctrine of election, or hear it condemned (even by good men) as a doctrine of devils. For my own part, I cannot see how true humbleness of mind can be attained without a knowledge of it. But what shall I say? Election is a mystery that shines with such resplendent brightness that, to make use of the words of one who has drunk deeply of his electing love, it dazzles the weak eyes even of some of God's dear children. If we are Christians, we have understood and acted upon the finished work of Christ once and for all at our justification, and our guilt is gone forever. Now let us understand and act upon the practice of that same work moment by moment in our present lives. Let me repeat: the only difference in the practice is that in justification it is once for all, and the Christian life is lived moment by moment. The Christian life is acting moment by moment on the same principle, and in the same way, as I acted at the moment of my justification. But let us notice that from another perspective, even at this point it is not really different, because life is only a succession of moments, one moment at a time. When we say 'moment by moment,' we are dealing in practice with a succession of single, historical moments. No one lives his whole life at a time. This is another of these places where the existentialists have made a very accurate observation. Life is not a once-for-all thing; it is a series of moments. So when I talk about living the Christian life moment by moment, I can only live it in practice one moment at a time, just as my justification took place in one moment. There is no other way to do it. In this sense, the difference is not absolute between the two. Nobody can live except moment by moment, and only one moment at a time. . . . So we must believe God's promises at this one moment in which we are. Consequently, in believing God's promises, we apply them--the present meaning of the work of Christ for the Christian--for and in this one moment. If you only can see that, everything changes. As we believe God for this moment, the Holy Spirit is not quenched. And through his agency, the risen and glorified Christ, as the Bridegroom of the bride, the Vine, brings forth his fruit through us at this moment. This is the practice of active passivity. And it is the only way anybody can live; there is no other way to live but moment by moment. Conclusion: I do not have to live an entire life's worth of Christian obedience and risk and self-denial today. I am called simply to let today unfold, taking God at his word moment by moment, receiving the gospel down into my soul hundreds of times today, hitting refresh time and again. Each day has enough trouble of its own. There, despite the presence of elements we should now find it hard to regard as religious at all, and the absence of elements which some might think essential to religion, I find an experience fully God-centered, asking of God no gift more urgently than His presence, the gift of Himself, joyous to the highest degree, and unmistakably real. What I see (so to speak) in the faces of these old poets tells me about the God whom they and we adore. Then Luther makes an important distinction in explaining what he means by 'of necessity.' Very helpful, and strikingly similar to Edwards' Freedom of the Will. Now, by 'necessarily' I do not mean 'compulsorily'. . . . That is to say, when a man is without the Spirit of God he does not do evil against his will, as if he were taken by the scruff of the neck and forced to it, like a thief or robber carried off against his will to punishment, but he does it of his own accord and with a ready will. And this readiness or will to act he cannot by his own powers omit, restrain, or change, but he keeps on willing and being ready; and even if he is compelled by external force to do something different, yet the will within him remains averse and he is resentful at whatever compels or resists it. He would not be resentful, however, if the will were changed and he willingly submitted to the compulsion. . . . Ask experience how impossible it is to persuade people who have set their heart on anything. If they yield, they yield to force or to the greater attraction of something else; they never yield freely. . . .
By contrast, if God works in us, the will is changed, and being gently breathed upon by the Spirit of God, it again wills and acts from pure willingness and inclination and of its own accord, not from compulsion, so that it cannot be turned another way by any opposition, nor be overcome or compelled even by the gates of hell, but it goes on willing and delighting in and loving the good, just as before it willed and delighted in and loved evil. Sovereign, regenerating grace does not force us to do what we don't want to do. More deeply, it brings us to want to do what we should want to do. It gets underneath even our felt levels of desire. I can get my 3-year-old Nathan into bed by picking him up, kicking and screaming, and carrying him. Or I can get him into bed by promising him that Where's Waldo and castle legos await him in his bed. Strategy #1 is not what Calvinists mean by irresistible grace. But even strategy #2 doesn't quite capture it. Even in #2 Nate isn't getting into bed out of a delight to obey but because I've dangled something else in front of him. His desire to look for Waldo and play legos passes the threshold of his desire to stay downstairs. But he still doesn't delight in obedience. The will remains untouched. It is a book, not me, that he wants. Irresistible grace is grace that softens us way down deep at the core of who we are. Taste bud transformation. In a miracle that can never be humanly manufactured, we find ourselves, strangely, delighting to love God. This is a big God, with big grace. Whatever is not an exhibition that God exists misses the whole purpose of the Christian's life now on the earth. According to the Bible, we are to be living a supernatural life now, in this present existence, in a way we shall never be able to do again through all eternity. We are called upon to live a supernatural life now, by faith. Eternity will be wonderful, but there is one thing heaven will not contain, and that is the call, the possibility, and the privilege of living a supernatural life here and how by faith before we see Jesus face-to-face. By the way, would you admit this--that to lose the sense of man's greatness is not fatal when men think something else great instead? Man can look pretty small in the Psalms, Pindar, Aeschylus, and Lucretius: but the poetry remains glorious because God, or the gods, or Natura are great. The modern predicament is that having voted man into the chair and then lost belief in Man, there is no glory left. Growth in loving God repairs the deformed self. The point is not that a proper understanding of self leads to finding God but that a proper understanding of God is the only way to come (gradually) to a purified self--that is, a happy self. A great many people (not you) do now seem to think that the mere state of being worried is in itself meritorious. I don't think it is. We must, if it so happens, give our lives for others: but even while we're doing it, I think we're meant to enjoy Our Lord and, in Him, our friends, our food, our sleep, our jokes, and the birds' song and the frosty sunrise. If you know Christ and him crucified, you know enough to make you happy, supposing you know nothing else. And without this, all your other knowledge cannot keep you from being everlastingly miserable. 1. All those interviewed believed in heaven. 2. All those interviewed assumed they would be there. 3. When asked to describe heaven, not one of those interviewed mentioned that God was there. But it is the presence of God in holy, loving majesty that makes heaven what it is. It can even be said that heaven is the presence of God--being in heaven means living with him forever. A Philistine will stand before a Claude Monet painting and pick his nose; a person filled with wonder will stand there fighting back the tears. By and large, our world has lost its sense of wonder. We have grown up. September 16, 2012 from SGCLouisville on Vimeo. It is written that we shall “stand before” Him, shall appear, shall be inspected. The promise of glory is the promise, almost incredible and only possible by the work of Christ, that some of us, that any of us who really chooses, shall actually survive that examination, shall find approval, shall please God. To please God . . . to be a real ingredient in the divine happiness . . . to be loved by God, not merely pitied, but delighted in as an artist delights in his work or a father in a son—it seems impossible, a weight or burden of glory which our thoughts can hardly sustain. Love for men is not to be just a banner, not just a slogan, but it should show itself in practical ways in our lives. Our acts and our utterances in our contacts with men should show this love. We should show it by kindness in the small and large things of our daily living. The rule is that we should do to others as we desire that they should do to us. . . .
Our walk should be such that even the blasphemer must know inwardly that we have dealt fairly with him. Rightness and love must go hand in hand or there is no real power. Showing a man to be wrong is only the first step; the final aim must be to lead him to full obedience to Christ. In dealing with the unbeliever our final desire for him must be his salvation, no matter how hopeless that seems. No man is beyond the infinite grace of God. The science of this world . . . has examined everything heavenly that has been bequeathed to us in sacred books, and, after hard analysis, the learned ones of this world have absolutely nothing left of what was once holy. He who can sit with ten open commentaries and read the Holy Scriptures--well, he is probably writing the eleventh, but he deals with the Scriptures contra naturam. It is not hard for me to believe God has put away all my old failures that occurred before new birth. What is hard is to believe that God continues to put away all my present failures that occur after new birth. We tend to view the Father looking down on us with raised eyebrows--'how are they still such failures after all I have done for them?' we see him wondering. A Christian conscience is a re-sensitized conscience. Now that we know God as Father, now that we have become human again, we feel more deeply than ever the ugliness of sin. Failure makes the soul cringe unlike ever before. That's why Romans 5:1-11 is in the Bible. Lots to say about 5:1-5 and the present peace believers enjoy because of the past justification that has been secured, but here's something I'm reflecting on this week from verses 6-11. Three times Paul says that God did something to save us when we were hating him. Weak. Sinners. Enemies. We didn't have to clean ourselves up first. He didn't meet us halfway. He pulled us out of the moral mud in which we were drowning. That's great news. But that's not Paul's burden in these verses. He's after something else. What's the ultimate point Paul is driving at in Romans 5:6-11? Not God's past work, mainly. Paul's burden is our present security, given that past work. He raises Christ's past work to drive home this point: If God did that back then, when you were so screwy and had zero interest in him, then what are you worried about now? The whole point of vv. 6-11 is captured in the "since" of v. 9: "Since, therefore, we have now been justified by his blood, much more shall we be saved by him . . ." It is not hard for him to hug you in your mess now that the hard part's done. This really helps us relax. He drew near to us when we hated him. Will he remain distant now that we want to please him? He suffered for us when we were failing, as orphans. Will he cross his arms over our failures now that we are his adopted children? His heart was gentle and lowly toward us when we were lost. Will his heart be anything different toward us now that we are found? "While we were still." He loved us in our mess then. He'll love us in our mess now. Our very agony in sinning is the fruit of our adoption. A cold heart would not be bothered. We are not who we were. Christ loved you before all worlds; long ere the day star flung his ray across the darkness, before the wing of angel had flapped the unnavigated ether, before aught of creation had struggled from the womb of nothingness, God, even our God, had set his heart upon all his children.